Ohmconnect and Schneider Electric debut a concept for making connected homes an asset for grid operators. Energy-smart homes mainly pay themselves off in energy saved. They can also enlist in a demand-response program and get paid a set amount for turning down power use via direct utility control, or in response to set price signals. But rarely do we see energy-responsive homes playing the grid markets. Grid operators are looking for megawatts -- or at least, hundreds of kilowatts -- of flexible load to participate in energy and ancillary services markets. 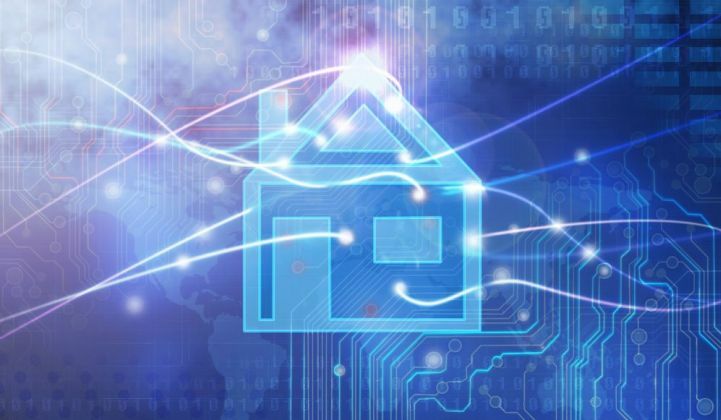 Even if lots of homes can be aggregated to reach those volumes, there are the costs of connecting them to real-time dispatch and verification systems to consider. There’s also the fact that most regulations to allow this kind of aggregated, grid-responsive activity are very limited. Now a new pilot project being conducted by grid giant Schneider Electric and startup Ohmconnect is seeking to overcome these barriers. 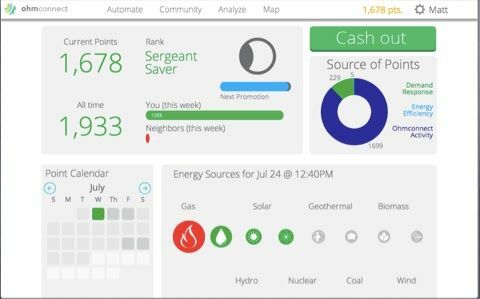 Under the pilot, customers of California’s big three utilities can apply to receive a full suite of Schneider’s Wiser line of home-energy management devices -- Wi-Fi-connected thermostats, smart plugs, remote-controlled pool pumps, and even smart electric-vehicle chargers -- at reduced cost. Then, Ohmconnect will use its software to aggregate that whole-home load flexibility and put it into service for California’s grid operator, CAISO. It can do this without having a direct relationship with utilities, under some of the state’s first-ever pilot programs that allow non-utility actors to participate directly in the same systems that call upon large generators and demand response portfolios to help CAISO manage its real-time grid-balancing needs. “This is a first-of-its-kind pilot, and one that we’re particularly excited about since it opens up the opportunity to directly control some of the largest and most predictable load resources in California,” Curtis Tongue, co-founder of Ohmconnect, said in an interview last week. For homeowners who commit themselves to turning over large chunks of their home energy to this remote control, the paybacks can be significant, said Tongue. Some of these “super-users” -- early adopters who’ve connected lots of in-home loads to wireless control, plus a few big ones like a pool pump or a smart EV charger -- have been able to earn about $200 in annual PayPal or Venmo payments from using the service. That’s not energy savings, by the way. It’s revenue, earned by promising to make a certain amount of load ready to disappear at any given hour the next day, and then getting paid based on the 15-minute locational marginal price (LMP). This is a more complicated transaction than traditional demand response, which turns down lots of air conditioners or delays pumps and appliances via direct utility control, usually under a strict schedule, and in exchange for an upfront fee. But it also offers the potential for expanding the scope of grid-responsive homes far beyond the demand-response programs being offered by utilities right now -- something that California regulators are demanding to better utilize the state’s largely latent demand-side grid potential. Energy saving tends to fall rather low on the list of reasons that homeowners choose to invest in smart devices and home automation. Home security and safety, comfort and convenience, and the “wow factor” for early adopters are more compelling value propositions. There’s also the fact that most people don’t pay too much attention to their utility bills, unless they suddenly go up. But adding a month-by-month revenue stream on top of utility bill savings could significantly reduce the payback time for home-automation investments to three years, according to Ohmconnect. That’s not a unique claim. Nest Labs, the Google-owned maker of sleek and trendy smart thermostats, smoke alarms and internet cameras, says that energy savings can pay back the $250 cost of a Nest thermostat within two years, for example. But Ohmconnect’s approach could open up more opportunities for do-it-yourself combinations of home devices to increase that payback. That will depend on two things. First is how many devices Ohmconnect can integrate. Right now, the startup’s platform works with smart thermostats from Nest, ecobee, Honeywell and others; smart wall plugs from the Schneider Electric Wiser lines and the Belkin WeMo; and various electric-vehicle chargers, according to last week’s announcement. The second key factor is whether or not Ohmconnect’s thousands of California customers live in areas that are open to having them integrated for participation in grid markets. Right now, Pacific Gas & Electric has taken the lead on this front with its Intermittent Renewable Management Pilot Phase 2 last year, and the newly launched Supply Side Pilot this year. California’s other big investor-owned utilities, Southern California Edison and San Diego Gas & Electric, are also under regulatory mandate to create “direct participation” demand-response programs that could open similar opportunities for Ohmconnect in their territories.